John McEwen became Australia's 18th prime minister after the disappearance of Harold Holt, and until the Liberal Party elected a new leader. John McEwen was universally described by colleagues and opponents as formidable, both in physical presence and in the way he prosecuted his political objectives. Menzies dubbed him ‘Black Jack’ because he reminded him of a legendary Scottish warrior, but quite possibly also due to his dark demeanour when crossed. McEwen briefly worked as a junior in the Crown Solicitor’s office in Melbourne for Fred Whitlam, father of Gough Whitlam. He left to join the Army, but before he could serve overseas the First World War ended. McEwen was eligible for a soldier settler land grant and began farming near Stanhope in Victoria. His hand-to-mouth struggle through drought and depression defined McEwen and drove him into rural politics. After gaining prominence with the Victorian Farmers’ Union, he became the member for the federal seat of Echuca in 1934. 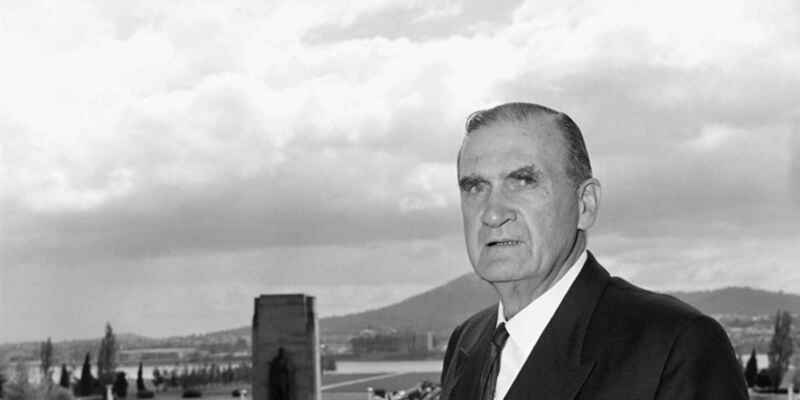 McEwen became leader of the Country Party and Deputy Prime Minister in 1958 and was a minister for 24 years of his 37 years in Parliament. He held portfolios in aviation, external affairs and was a member of the Advisory War Council. He became Minister for Commerce and Agriculture in 1949 which later became Trade and Industry and he turned it into a super-ministry rivalled only by Treasury. McEwen retired from politics in 1971. He was prime minister for just 23 days, yet is considered by many to be one of our most influential politicians, particularly in the area of trade policy. On 20 December 1967 John McEwen gave a press conference to reassure the public that 'he assumed the office of Prime Minister with no sense of personal gratification.' He indicated he would retain the position only until the Liberal Party elected a new leader and stressed continuity in relation to the Vietnam War, broader foreign policy and maintenance of national growth. Federal funding of up to $3.5 million in non-repayable grants is announced for Victoria on 21 December to mitigate salinity in the Murray River at Mildura and Barr Creek. The memorial service for Prime Minister Harold Holt was held in St Paul's Cathedral, Melbourne, on 22 December 1967. It was attended by US President Lyndon Johnson, Prince Charles, British Prime Minister Harold Wilson and other heads of state and government. Government assistance is announced on 4 January to support the Braham family from Tenterfield in New South Wales, after Pat Braham gives birth to Australia's first naturally conceived quintuplets. McEwen's influence and power in the Coalition was such that after the disappearance of Harold Holt he advised Governor-General Richard Casey to appoint him as prime minister over Billy McMahon, the Liberal Party deputy leader. McEwen indicated that neither he nor the Country Party would serve under McMahon with whom he had a longstanding and bitter feud. He would be prime minister until the Liberal Party elected a new leader, although his action had effectively vetoed McMahon from contesting the leadership ballot. 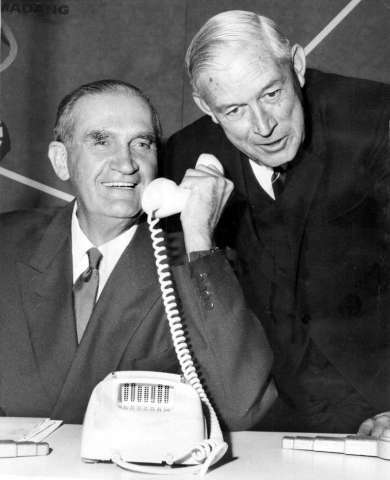 McEwen’s standing was such in the Coalition that after Holt’s memorial service Liberal Party officials held a meeting to discuss the amalgamation of the two parties with McEwen to stay on as prime minister. McEwen as party leader evoked tremendous respect, loyalty and, on occasion, fear from his Country Party colleagues. Fellow ministers recalled that in Cabinet meetings when McEwen spoke everyone listened. McEwen was also astute with regard to the long-term viability of the Country Party, expanding its political base to include manufacturing interests and encouraging succession planning through mentoring younger potential leaders. Papers of Sir John McEwen, 1943-1980. Tatsuo Kawai with Sir John McEwen, 196? McEwen had few close friends, but he did form bonds with men who, like him, were down- to-earth, practical and self-starters. McEwen had such a rapport with William Gunn, who was chairman of the Australian Wool Corporation until 1973 and the dominant figure in the wool industry. Gunn was a highly effective political operator and enthusiastic protectionist who had worked closely with McEwen over many years on the divisive issue of achieving a reserve price system for wool. Gunn and McEwen had first argued for a reserve price scheme in 1951 and in 1970 it was introduced. Both men knew what it was like to face protests from a rural constituency who were often hostile to government intervention. It was not unknown for McEwen to phone Gunn at all hours for advice and a sympathetic ear. Mary McEwen said of their relationship, ‘they were simpatico’. McEwen’s respect for Gunn extended to encouraging him to stand for pre-selection in 1966 for the Country Party seat of Maranoa in Queensland and he even considered him a potential successor as party leader. Gunn did stand, but was not pre-selected. McEwen campaigned to his rural constituents, in the time-honoured tradition, on street-corners or open-air meetings conducted from the back of a truck. McEwen was an effective speaker who focused on a key message and argued it well. He did not waste words, in keeping with his no-nonsense political approach. The journalist Wallace Brown recalled that he would always establish his credentials with an audience, ending his speeches with, ‘I am a simple farmer like yourselves. I know your problems. 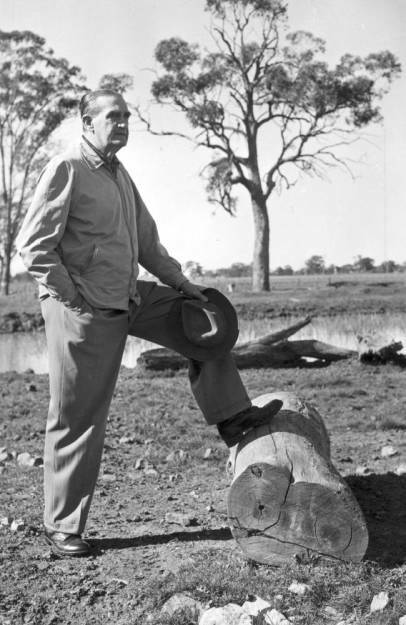 In fact, I’m on my way back to my farm in Victoria now.’ As part of this strategy McEwen in his speeches would promote the Country Party in the Coalition and refer to the McEwen- Menzies government. Brown asked McEwen about this and he replied, ‘Bob knows what I’m up to. He also knows we have to keep winning in the bush.’ The approach did not always work; addressing dairy farmers over butter prices at Warwick in Queensland in 1955, McEwen and the chairman of the event angrily snatched the microphone from each other. The local newspaper described the meeting as the wildest since eggs were pelted at Prime Minister Billy Hughes in 1917. I think that, rather more than other parties, the Country Party fellows feel they're here for a purpose - they want something. Mostly they live in a pretty tough environment, climatically and economically, and none of them are dreamers.